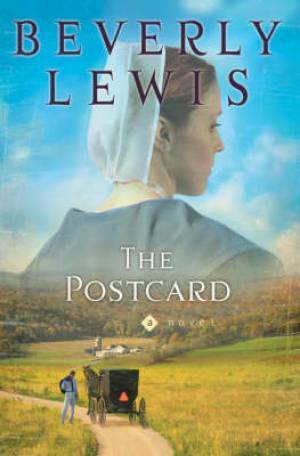 Postcard be New York Times best-selling author Beverly Lewis tells a story about a long forgotten message that threatens an Amish community united in secrets. Rachel Yonder a new older Amish women returns to her arguing parents with her young daughter after becoming a widow due to a tragic accident, losing her husband and son two years ago. In a quaint Lancaster county town, Rachel with her cheerful yet subdued helps her parents run a bed and breakfast. Philip discovers a postcard written in illegible Pennsylvania Dutch in the dresser of his room  leading to a series of events and to the heart of the Amish life and to the bedside of a mysterious woman known as "The Storyteller. The postcard becomes a link to the haunted past and the woman weaves a fascinating tale thats as old as herself about a community secret and that has been shattered by betrayal. Despite the attempts of the community to protect her from the outside Philip's and Rachel's lives become intertwined. Torn between her heart and the devotion to the people she loves Rachel searches her past to restore old wounds in order than new love might grow. The Postcard by Beverly Lewis was published by Bethany House in January 2007 and is our 21309th best seller. The ISBN for The Postcard is 9780764203404. Be the first to review The Postcard! Got a question? No problem! Just click here to ask us about The Postcard.